We had just gotten back from the Routeburn and Hollyford Tracks and Megan and her family were coming through town on their way to Queenstown for a little sightseeing. Unfortunately, our trip to Sandfly Bay to see the sea lions and penguins was dowsed with a random rain shower. Instead, we spent the night in the Speight's Ale House and at the Dunedin Casino. Megan's dad Brian was nice enough to spot us all $50 to be returned if we won. After 3 hours or so, it seemed like counting cards was useless as the dealer was practically shoveling chips into our laps. I won $250 and Megan and Brian each won more than that. Alex was the only one down on the night but we walked away feeling pretty good. With the extra cash in hand, it didn't take a lot from Megan to convince me to come up to Queenstown with them for another round of bungy jumping with A.J. Hackett. 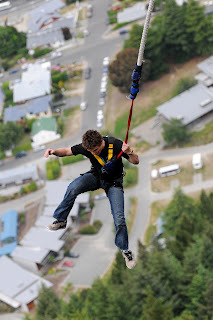 Megan, Brian, Alex and I all plunged off The Ledge bungy off the gondola high above town. 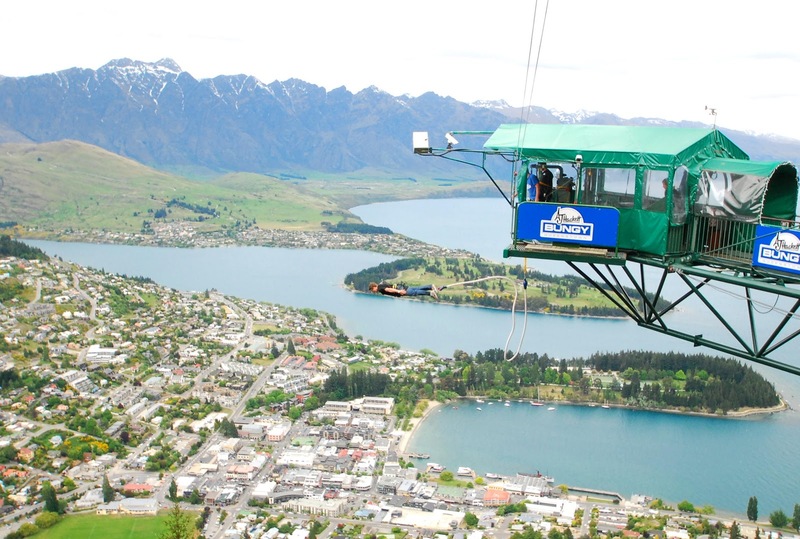 It was the best way I could possibly think of to cap off my time in New Zealand. The next morning after a conference call back home for a school project, I hitchhiked 4 hours back to Dunedin and packed up to leave. Traveling for 36 hours on the way home didn't seem that bad as it was a small thrill to seemingly travel back in time. I left Auckland airport at 10:30 AM only to arrive in SFO at 10:00 AM. 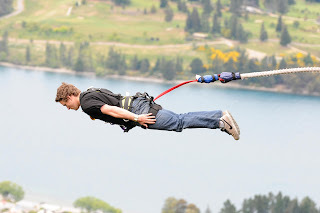 I guess bungy jumping put a little piece of superman in me. Check out video of the jump here. Routeburn & Hollyford Tracks from Tyler Grubb on Vimeo. Amy, Michelle, Nathan and I hiked up the Routeburn Track to Mackenzie Hut where views of snowy mountains and raging waterfalls weren't uncommon. Because of avalanche danger, the track was closed shortly after the hut. A $75 helicopter ride was offered to bypass the danger zone but our group was on a tight budget and decided to backtrack and explore some other areas. We decided on the Hollyford Track just down valley. Lots of sandflies and a couple deer hunters accompanied us at the hut the next night before we hiked out to return to Dunedin.